(Chicago, IL)- A 25th anniversary is certainly a cause for celebration, and this year Shaw's Crab House will be toasting a quarter century of its annual Oyster Fest. To kick off the festivities, Shaw's Chicago is hosting Chef Sandy Ingber of New York City's legendary Grand Central Oyster Bar for a special book signing and dinner on Wednesday, October 9, 2013. The event will also commemorate Grand Central Oyster Bar's landmark 100th anniversary. The dinner will begin at 6:30 p.m., featuring a five-course oyster-focused menu highlighting dishes inspired by Grand Central and cooked up by Shaw's Chef Arnie Tellez along with guest Chefs Giuseppe Tentori of GT Fish & Oyster and Brian Huston of The Publican in Chicago. The price for the Grand Central Oyster Bar Dinner at Shaw's Crab House is $125 per person (includes the cookbook, excludes tax and gratuity). Reservations are required and can be made by calling Shaw's Crab House at 312.527.2722. Shaw's Crab House Managing Partner Steve LaHaie says, "The Grand Central Oyster Bar was an important inspiration to the oyster program at Shaw's. We've tried to emulate the best and hope we will be around for 100 years as well." Chef Huston says of his acclaimed Fulton Market restaurant, "Oysters are at the core of The Publican's menu, and were the initial inspiration for the concept." Chef Sandy Ingber will also be on hand to sign copies of his upcoming cookbook, "The Grand Central Oyster Bar & Restaurant Cookbook: Recipes and Tales from a Classic American Restaurant" ($35 per book), which marks the eatery's centennial. The book signing will take place from 4:00 p.m. to 6:00 p.m. in Shaw's Chicago Oyster Bar and is open to the public. Guests will enjoy ½ priced oysters, passed oyster biscuits, and a complimentary glass of sparkling wine. for up-to-the-minute 25th Anniversary Oyster Fest updates! With fall at our doorstep, the scent of fresh pumpkin and autumnal spices have started wafting through the kitchen at Prairie Grass Cafe (601 Skokie Blvd. Northbrook, IL 847-205-4433). "The first batch of heirloom pumpkins just arrived," says Northbrook's Prairie Grass Cafe chef/owner Sarah Stegner. "We have our pumpkins specially grown for us by farmer Tracey Vowell from a local farm, Three Sisters Garden, in Kankakee, IL," she says. "It's a special time of year. We use between 1,000- and 1,500 lbs each season." Pumpkins dishes typically run mid-September through November, as long as the pumpkins are available. Expect to find offerings including: Grilled Honey Glazed Heirloom "Luxury Pie Pumpkins" with Capriole Farm Goat Cheese and Toasted Pumpkin Seeds ($8.50); Three Sisters Garden Heirloom Luxury Pie Pumpkin Soup ($5.50); Maple Leaf Farm Crispy Half Duck with Roasted Pumpkin and Heirloom Kale with Huckleberries Sauce ($28); Roasted Pumpkin Fritters with Pumpkin Honey Butter ($8), Stuffed Pumpkin French Toast with Grilled Pumpkin Wedges ($12) and Sarah's Mom's Pumpkin Pie with Whipped Cream ($7.50). Prairie Grass Cafe uses two pumpkin varieties. The first, the Heirloom Luxury Pie Pumpkin, is a beautiful pumpkin that was introduced in 1893 by Johnson & Stokes. The Heirloom Luxury Pie Pumpkin is a lovely golden fruit with white netting, typically in the 6lb range and perfect for pie making. In fact, this is one of the best tasting pie pumpkins you can use; with very sweet and smooth flesh, it's a favorite of all who use it," according to SeedSavers.org. Sarah says it's petite and has a smooth silky texture and intense pumpkin flavor. "It's also perfect for our grilled pumpkin." The second variety used by Prairie Grass Cafe is a large pumpkin called Kankakee Brown, says Stegner. "It's a special variety that only Three Sisters Farm grows." It has rich flavor and the meat is dense, not stringy. About Three Sisters Farm Tracey Vowell and Kathe Roybal worked in the restaurant industry until they grew tired of the hard work and decided on a career change. They bought their nine-acre farm in 2000, and named it after the Native American practice of growing corn, beans, and squash in the same mounds - a sophisticated, sustainable system that provided long-term soil fertility and a healthy diet then, and still does. The partners (that's Tracey on left, Kathe at right) focus on specialty vegetables like microgreens (which they grow year-round), pea shoots, heirloom tomatoes, summer and winter squashes, herbs, fresh beans (shelled at the Market) and huitlacoche, a mushroom particularly prized in Mexican cuisine. Tracey from Three Sisters Garden agreed to grow Heirloom Luxury Pie Pumpkins for me. They are less stringy and less watery then a regular pumpkin. They have intense pumpkin flavor. Each year we have sold out on all her pumpkins. This year she grew 1500 lbs for us! They are really delicious! In a large soup pot sauté the pumpkin in the olive oil with the onions, thyme, bay leaves and salt. Cook over medium heat until the onions are transparent. Do not add color to the vegetables. Add the chicken stock and simmer for 30 minutes or until the pumpkin is tender and the liquid reduces by about a ¼ of it's original volume. Add the cream and simmer another 5 minutes. Remove from the stove. Take the thyme and bay leaves out of the soup. Blend well. Serve hot with toasted pumpkin seeds and popcorn. “SHIFT: A New Media Exhibit by Luftwerk,” opening September 14 through January 5, 2014, explores the theories and principles of color, its synesthetic relationship with sound and sensibility, and the infinite quality of moving light. Three distinct yet interconnected installations transport the viewer into an immersive experience of projected video, light and resonance, all within the combined spaces of the Chicago Rooms (second floor) at the Chicago Cultural Center (78 E. Washington St.). Luftwerk is the collaborative vision of Petra Bachmaier and Sean Gallero. Their multi-media art installations combine the visual elements of light with the sculptural facets of architecture and design. Previous site-transforming installations have been presented at the iconic Frank Lloyd Wright-designed home “Fallingwater” in Pennsylvania, Kennedy International Airport in New York and – just last year – the Cloud Gate sculpture at Chicago’s Millennium Park. An opening reception is scheduled on September 13, 5:30–7:30 p.m. as part of the Chicago Cultural Center Fall Open House. This exhibition will also be showcased during the inaugural Chicago Music Summit’s free Music Showcases on September 20, 6:30–8:45 p.m. Chicago musicians Owen Clayton Condon and Atmospheric Audio Chair will be pushing the boundaries of improvised and ambient sounds, performing individually as well as collaboratively in this immersive environment by Luftwerk. Another immersive experience will be offered to the public during the Super Nature Installation on October 11 and 12, 12–5 p.m., performed by BodyCartography Project (Minneapolis, Minn.) as part of the new SpinOff dance series. In an empty gallery, one member of the public will meet one performer and have a non-verbal interaction. Both performer and audience will have agency to transform the energy of the space through their behavior and social interaction, sometimes very subtle and sometimes extreme. Reservations are highly recommended. To secure your 10-minute slot, visit https://dcasesupernature.eventbrite.com/. “SHIFT” is free admission, presented by the Chicago Department of Cultural Affairs and Special Events. Exhibition hours are Monday–Thursday, 10 a.m.–7 p.m. and Friday–Sunday, 10 a.m.–6 p.m.; closed holidays. For more information, call 312.744.3316; TTY 312.744.2964 or visit chicagoculturalcenter.org or luftwerk.net. 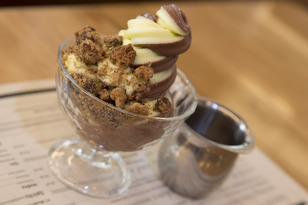 Little Market Brasserie unveils a fun new twist on a classic dessert favorite. To perk up Mondays, guests are invited to enjoy a build-your-own sundae station, set up in the bar. Diners can order the sundae special and are served a bowl of house-made ice cream that they can top with a variety of special treats including: hot fudge, strawberry, and caramel sauces; a variety of fresh fruit; three flavors of marshmallows; peanuts; Maraschino cherries; whipped cream; brownies; cookie dough; and shortbread sticks. Every Monday evening, starting September 16, from 3:30 to 11 p.m.
Little Market Brasserie is located inside the Talbott Hotel at 10 E. Delaware St. in the Gold Coast neighborhood of Chicago and is open for breakfast 6:30-11:30 a.m.; lunch 11:30 a.m.-3 p.m. Dinner will be served 3:30-11 p.m. Sunday-Wednesday and 3:30 p.m.-midnight Thursday-Saturday. Brunch is offered from 6:30 a.m.-3:30 p.m. Saturday and Sunday. Reservations can be made by calling 312.640.8141. For more information, visit www.littlemarketbrasserie.com, and follow Little Market Brasserie on Facebook and Twitter. Mercadito Hospitality has grown from its first New York City restaurant location in 2004 to become a renowned restaurant group. The popularity of the group’s restaurants can be attributed to Partners Alfredo and Felipe Sandoval, innovative culinary interpretations created by Chef/Partners Patricio Sandoval and Ryan Poli, and its joint venture with renowned consultants Paul Tanguay and Tad Carducci – the Tippling Bros – who bring inimitable flavor profiles to the group’s beverage programs. Based in Chicago, the group owns and operates restaurants and bars across the U.S. including the flagship concept, Mercadito in Miami, Chicago, and New York City; Double A, a cocktail lounge located beneath Mercadito Chicago; Tavernita and Barcito in Chicago’s River North neighborhood; and Little Market Brasserie at Chicago’s Talbott Hotel. MH Catering was launched in 2013 and the group’s newest concept, Tippling Hall, will open in the fall of 2013 in Chicago. Additional projects in Las Vegas and Philadelphia are slated to open in 2014. For more information, please visit www.mercaditohospitality.com, www.mercaditorestaurants.com, www.doubleachicago.com, www.tavernita.com, www.standandeat.com, www.littlemarketbrasserie.com, and www.mh-catering.com. "ONCE UPON A DREAM STARRING THE RASCALS" Announces Limited Chicago Engagement! Broadway In Chicago and Producers Steven Van Zandt and Maureen Van Zandt, Marc Brickman, and BASE ENTERTAINMENT, are thrilled to announce that following a critically acclaimed, sold-out Broadway engagement, ONCE UPON A DREAM STARRING THE RASCALS will debut in Chicago at the Cadillac Palace Theatre (151 West Randolph) from Nov. 5 - 10, 2013 for five performances only. Individual tickets will go on-sale to the public on Friday, Sept. 20, 2013 at 10 a.m.
A hybrid of a rock ‘n’ roll concert and a Broadway show, ONCE UPON A DREAM STARRING THE RASCALS marks the first time The Rascals, America’s classic blue-eyed soul band, have played together since 1970. Original band members Felix Cavaliere (keyboard & vocals), Eddie Brigati (vocals), Dino Danelli (drums) and Gene Cornish (guitar) will present a complete concert performance including songs that captured the spirit of America in the 1960’s, such as their smash hits “Good Lovin’,” “Lonely Too Long,” “It’s a Beautiful Morning,” “How Can I Be Sure” and “Groovin’.” The production will also feature the history of the iconic group told through archival footage, narration, and dramatic film segments viewed on the latest LED screen technology. ONCE UPON A DREAM STARRING THE RASCALS premiered on Broadway’s Richard Rodgers Theatre to critical acclaim last spring selling out 15 performances. The show is directed by Steven Van Zandt and Marc Brickman, with music by Felix Cavaliere and Eddie Brigati. ONCE UPON A DREAM STARRING THE RASCALS has stage, video and lighting design by Brickman and has music production and is written by legendary guitarist Van Zandt. For more information go to RascalsDream.com, visit the show’s Facebook page at Facebook.com/RascalsDream, or follow the show on Instagram and Twitter: http://instagram.com/rascalsdream & https://twitter.com/RascalsDream. Tuesday, Nov. 5, 7:30 p.m.
Wednesday, Nov. 6, 7:30 p.m.
Friday, Nov. 8, 7:30 p.m.
Saturday, Nov. 9, 8:00 p.m.
Sunday, Nov. 10, 2:00 p.m. Individual tickets go on-sale Friday, Sept. 20, 2013 at 10 a.m. Ticket prices range from $45 to $75. A select number of premium seats are also available for many performances, as well as a special package featuring premium seating and a meet and greet. The presale for Citi cardmembers starts on Sept. 17, 2013 at 10 a.m. For more details, visit citiprivatepass.com. Groups of 10 or more are available by calling Broadway In Chicago Group Sales at (312) 977-1710. Tickets are available at all Broadway In Chicago Box Offices (24 W. Randolph St., 151 W. Randolph St., 18 W. Monroe St. and 175 E. Chestnut), the Broadway In Chicago Ticket Kiosk at Water Tower Place (845 N. Michigan Ave.), the Broadway In Chicago Ticket Line at (800) 775-2000, all Ticketmaster retail locations and online at www.BroadwayInChicago.com. THE RASCALS, formerly known as The Young Rascals, are one of the most influential, and artistically important American bands in Rock and Roll history. In a time dominated by the English rock acts of the British Invasion, The Rascals not only survived but thrived. The post-twist New York, New Jersey, and Long Island club scenes bred the band, an outfit whose sound grew more sophisticated as time went on but stayed rooted in the blue-eyed soul that was its first reason for being. At first a hard-hitting band reminiscent of the early Animals, the Rascals drew from the same well that fed the then-burgeoning garage rock scene. They would go on to lead the way for Blue Eyed Soul to Folk Rock to Protest to Civil Rights, blending white Pop melodies with black soul and R&B muscle. Though they never brandished their politics like some bands, the Rascals truly lived theirs, fighting discrimination by demanding that a black act appear on the bill at each of its concerts. Their music would span the entire decade from the early Go-Go dance parties right through the psychedelic era - and beyond. The band released numerous top ten singles in the mid- and late-1960s, including “How Can I Be Sure”, “Come On Up”, "You Better Run", "I've Been Lonely Too Long", “Beautiful Morning”, and the #1 hits "Good Lovin'", "Groovin'", and "People Got to Be Free". They went their separate ways in the early 70's, finally reuniting for one night in May of 1997 when Steven Van Zandt inducted them into the prestigious Rock and Roll Hall of Fame. And now the day music historians never thought would happen, The Rascals' original lineup—Felix Cavaliere, Gene Cornish, Eddie Brigati and Dino Danelli—have reunited for their first public performances in 40 years with "Once Upon A Dream," a combination concert/theatrical event produced and directed by Steven Van Zandt and lighting/projection wizard Marc Brickman. Ladies and Gentleman....THE RASCALS ARE BACK! Bruce Springsteen and the E Street Band. Steven has also founded The Rock and Roll Forever Foundation (www.rockandrollforever.org) dedicated to the development, preservation, dissemination, and continuing support of Rock and Roll, past, present, and future - which is currently developing an online curriculum on the history of Rock and Roll and its role in American culture to both provide music education and defeat America’s High School dropout epidemic with a pilot program set to launch in schools in 2013. MAUREEN VAN ZANDT (Producer) is co-founder of the With Out Papers Theatre Company, where she produced and acted in numerous productions. She appeared as Gabriella Dante in the HBO series The Sopranos for six seasons. She is also the creator and choreographer of the dance group Garage Girls A Go Go, who have worked extensively in video, tv and onstage. Maureen recently served as dance supervisor on the upcoming David Chase film, Not Fade Away. She is currently working on a production of a new play, 40 CPS, with Sopranos and theatre company colleagues Vincent Pastore and Robert Funaro. She would like to thank Stevie Van Zandt because without him there is no dream. MARC BRICKMAN (Producer / Director / Staging / Video / Light Design) is a world renowned visual designer/director whose work and profile have been featured in publications and broadcasts including the New York Times, the television program “48 Hours” and others. Recognized as a cutting edge creative force and innovator in the industry, Brickman's awards and accolades include Emmy Awards and Cable Ace Award nominations for production design and best director. His work with Pink Floyd is legendary having been viewed by millions worldwide. Other projects include the worldwide expansion of The Blue Man Group. Artists Keith Urban, McCartney, Springsteen, Cirque Du Soleil "Viva Elvis," and The Black Eyed Peas all have called on Brickman's talent. BASE ENTERTAINMENT (Executive Producer) develops, produces and manages intellectual properties generated for live entertainment stages in North America, South America and Asia. BASE's current production activity in Las Vegas includes the following: Peepshow at Planet Hollywood, Rock of Ages at The Venetian, Jersey Boys at Paris, Absinthe at Caesars Palace, Defending the Caveman and Million Dollar Quartet at Harrah’s. Previous production activity in Las Vegas includes: Phantom at The Venetian, Wayne Brady - Making It Up at The Venetian, and Stomp Out Loud at Planet Hollywood. In addition, BASE operates the Showroom and PH Live at Planet Hollywood in Las Vegas. At Marina Bay Sands in Singapore, BASE programs both the Grand Theater, previously home to both The Lion King and Wicked, and the Sands Theater, where Jersey Boys recently launched a world tour (in partnership with Dodger Properties and Showtime). In Brazil, BASE, in partnership with Geo Eventos, recently produced Priscilla Queen of the Desert in Sao Paulo. Currently presented at Discovery Times Square in New York City, Spy: The Secret World of Espionage represents the premiere museum quality exhibition developed and presented by BASE. Beginning February 2014 in Toronto, BASE will also present the world premiere of the tango rock musical Arrabal. BASE Entertainment's headquarters are in New York, and its founders include industry veterans Brian Becker and Scott Zeiger. For more information please visit www.BASEentertainment.com. Labels: "ONCE UPON A DREAM" musical, EDDIE BRIGATI, FELIX CAVALIERE, Marc Brickman, Maureen Van Zandt, Steven Van Zandt, THE RASCALS"
GEORGE TILLMAN, JR. TO BE HONORED AT THE CHICAGO INTERNATIONAL FILM FESTIVAL’S BLACK PERSPECTIVES TRIBUTE! 6:00 pm at the AMC River East 21 (322 E. Illinois St.) and will be followed by a special presentation of Tillman’s latest film The Inevitable Defeat of Mister & Pete. Codeblack Films, a Lionsgate (NYSE: LGF) company, will release the film in select theaters on October 11. Academy Award® and Grammy Award®-winning actress and singer Jennifer Hudson, who stars in the film, is scheduled to join Tillman on the red carpet and at the Tribute. An After-party at Altitude at the W Chicago Lake Shore Hotel will immediately follow the tribute and film presentation. Directed by Tillman and written by Michael Starrbury, The Inevitable Defeat of Mister & Pete stars Skylan Brooks, Ethan Dizon, Jennifer Hudson, Jordin Sparks, Anthony Mackie and Jeffrey Wright. Jana Edelbaum, Rachel Cohen, and Bob Teitel produced the film with Alicia Keys, Susan Lewis, Clay Floren, Aimee Shieh, Julio Depietro, Keith Kjarval, Mary Vernieu, and Amy Nauiokas executive producing. Wright, Hudson and Mackie are previous Black Perspectives honorees. The Inevitable Defeat of Mister & Pete is a beautifully observed and tremendously moving film about salvation through friendship and the way transformation sometimes can happen just by holding on long enough. During a sweltering summer in New York City, 13-year-old Mister’s (Skylan Brooks) hard-living mother (Jennifer Hudson) is apprehended by the police, leaving the boy and nine-year-old Pete (Ethan Dizon) alone to forage for food while dodging child protective services and the destructive scenarios of the Brooklyn projects. Faced with more than any child can be expected to bear, the resourceful Mister nevertheless feels he is an unstoppable force against seemingly unmovable obstacles. But what really keeps the pair in the survival game is much more Mister’s vulnerability than his larger-than-life attitude. Columbia College Chicago graduate George Tillman, Jr. became inspired to make films on his own after seeing Cooley High and Taxi Driver. In 1994, Tillman wrote and directed his first feature film, Scenes for the Soul. Shot entirely in Chicago using local talent and resources, the film caught the attention of Doug McHenry and George Jackson who acquired it for Savoy Pictures for $1M. Following on the momentum of this success, Tillman began to write a script, loosely based on his own life – Soul Food. Soul Food’s cast included Vanessa Williams, Vivica A. Fox, Nia Long, Mekhi Phifer, Michael Beach, Irma P. Hall, and Brandon Hammond. Modestly budgeted at $7M, Soul Food opened to critical and financial success, grossing over $43M domestically. George's next directorial effort was Men of Honor, an epic story inspired by the life of Carl Brashear, a man who battled the obstacles of racism, a lack of education, and the loss of his leg to become the United States Navy's first African-American Master deep sea diver. The film grossed $85M worldwide. With partner Bob Teitel, Tillman co-produced the MGM film, Barbershop. Starring Ice Cube, Anthony Anderson, Sean Patrick Thomas, Eve and Cedric the Entertainer, Barbershop opened to record-breaking box office success, spawning the sequel Barbershop 2: Back in Business and Beauty Shop starring Queen Latifah. Tillman returned to the director’s chair with Notorious – about the life and death story of the Notorious B.I.G. (a.k.a. Christopher Wallace), which was released by Fox Searchlight and grossed over $43M worldwide. Most recently, Tillman directed Faster, starring Dwayne “The Rock” Johnson. Tillman resides with his family in Los Angeles. An Academy Award®-winning actress, Grammy Award®-winning recording artist and best-selling author, Jennifer Hudson most recently finished production on Black Nativity, where she stars alongside Forrest Whitaker, Angela Bassett and Mary J. Blige. The film, directed by Kasi Lemmons, is based on Langston Hughes’ gospel musical re-telling of the Bible's nativity story and will be released by Fox Searchlight Pictures in November 2013. This fall will also see Hudson starring alongside Terrence Howard in Darrell Roodt’s Winnie Mandela, in which she plays the titular role of activist, politician and ex-wife to South African President and revolutionary Nelson Mandela. The film will be released by Image this September. In 2007, Hudson won an Academy Award® for her role as “Effie” in the smash hit Dreamgirls. Her breakout film performance also garnered a Golden Globe Award, a Screen Actors Guild Award, a BAFTA and an NAACP Image Award. The Chicago International Film Festival’s Black Perspectives program was founded in 1997 in collaboration with legendary filmmaker Spike Lee. The program was created to showcase the talent of black filmmakers and to present films that break down barriers and shatter stereotypes. Past editions of the program have featured films by American luminaries such as Maya Angelou and Laurence Fishburne as well as the most recent works of African masters Djibril Diop Mambéty and Ousmane Sembene. The screenings are complemented by panel discussions and special screenings through our Education Outreach program. In addition to showcasing films that celebrate the depth and diversity of black cultures around the world, Black Perspectives has paid tribute to emerging and established film artists. The Black Perspectives Program is sponsored by State Farm and AARP. Moviegoer (10 regular admissions): $95 for Cinema/Chicago members, $125 for non-members. Individual tickets will be available to Cinema/Chicago members September 18-20. General public tickets will be on sale starting September 21. Festival screenings will be held at the AMC River East 21 Theater (322 E. Illinois St.). The full schedule will be announced on September 17. Led by Presenting Partner Columbia College Chicago, the 49th Chicago International Film Festival's sponsors include: Official Airline - American Airlines; Headquarters Hotel - JW Marriott Chicago; Producing Partners: AMC Theaters, The Academy of Motion Picture Arts and Sciences; Major Partner: Intersites; Supporting Partners: DePaul University School of Cinema and Interactive Media, Stella Artois, Effen Vodka, WBBM Newsradio 105.9, Cultivate Studios; Participating Partners: State Farm, AARP, Tres Generaciones®, Comcast, Allstate, Spotlight Cinema Networks, Casale del Giglio, Second City Computers, Shutterbox Entertainment, Gibson’s Restaurant Group, Creative Technology. Codeblack Films, a division of leading global entertainment company LIONSGATE®, is a vertically integrated film production and distribution company focused on providing independent studios, filmmakers, globally-recognized celebrities, intellectual property rights holders and brands cross platform monetization solutions. Entertainment industry veteran Jeff Clanagan founded Codeblack Films in 2012. Codeblack Films’ core objective is to super serve the global Black community with quality programming and help its content and brand partners access the enormous spending power of the rapidly growing African-American consumer market. Codeblack Films' understanding of the social context of this fast evolving market -- values, attitudes, behavior and current and emerging trends -- provides the Company with a unique ability to position its content and brand partners in the center of influence. Through parent company Lionsgate, Codeblack Films’ operational capabilities include motion picture production and distribution, strategic acquisitions, television programming and syndication, home entertainment distribution, digital distribution, new channel platform monetization and international distribution and sales.